Luminous Reflections: What would my "Uncle" Wassily think anyway? A Netherlands’ native, Willi was immersed in the abstract art of her parents and friends while growing up. Her father was so influenced by Wassily Kandinsky that he created a wonderful tribute of colorful patches ironed-on to a bamboo mat which was commercially acquired. Such “familiarity” led Willi to believe that Wassily was one of her many Dutch “Uncles”. Today, her husband loves pointing out her “Uncle’s” artwork in museums which always causes quite a stir in the presence of others! Willi’s artistry comes from within , but, also results from her life experiences, outside influences, and personal discoveries. Her joyful road to creating glass artistry has been long and winding. She has now created cast glass for over ten years and is eternally passionate about further developing her skills. Originally a photographer, she moved to New Mexico and then began wood and steel sculpting. Ironically, she worked as a spine research nurse and realized her steel sculptures reminded her of human spines. When she sculpted her first face, Willi spent weeks working her clay model, daily. One night she dreamt that her sculpted visage enlivened in the form of a complete woman, who with a smile said, “I love what you’ve done with my face!” Willi realized it was time to then make her mold of “Dream Woman”. Today, such visions are complimented by Willi’s ever-developing skills. She has studied with Czech Cast Glass Maestro Petr Stacho at the world’s oldest glass school. In July, she will continue her ongoing studies with another Czech Maestro, Frantisek Janak. Exploring the visual dimension and incorporating the luminosity of glass into it has been an enjoyable journey of which Willi will discuss in her Artist Talk on Saturday starting at 1:30 PM which is hosted by the Glass Alliance. We look forward to your visit. Bring your own “Artistic Uncle” along with you! Hilda Appel Volkin makes colorful, multi-dimensional wall hangings. Possibly, a conventional idea, until you discover that she combines fluorescent plexiglass with dichroic film to create her artistry. Why does Hilda use such unconventional materials? Fluorescent plexiglass transmits colored light to its edges which gives each piece a “lit” appearance. Dichroic film assists by splitting a light beam into two beams with different wavelengths. The film transmits one beam in color and reflects the other. Depending upon one’s viewing angle, new colors appear. 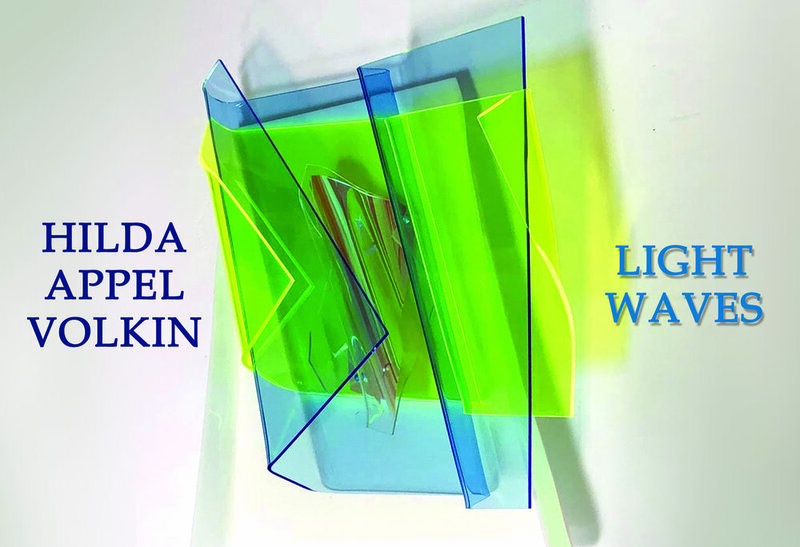 Working with light’s dynamic properties and being inspired by nature continually challenge Hilda to combine artistic and scientific principles in creative ways. Come see Hilda’s artistry. We promise an illuminating experience! 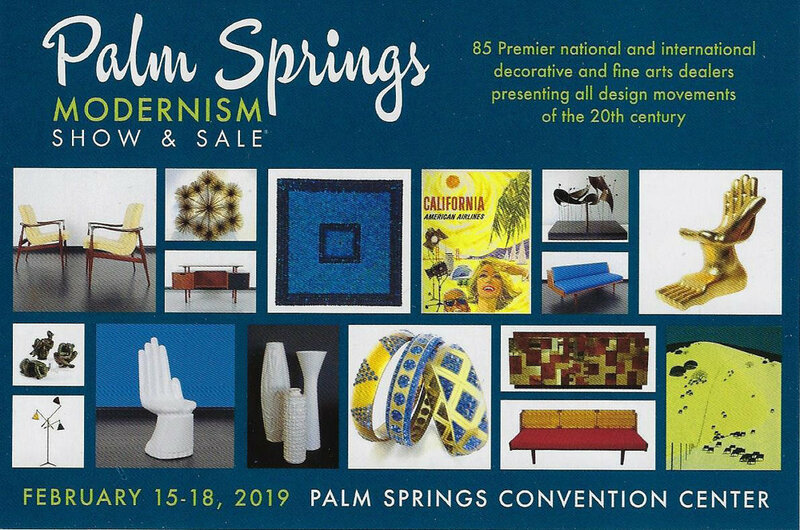 Palette Contemporary Art and Craft is pleased to be an exhibitor at Santa Fe’s Objects of Art show! It's A Mod, Mod World! Palette Contemporary Art and Craft is pleased to announce that we will be back at The Vintage Voltage Expo on Sunday, March 18,2018 at the Ramada Plaza Convention Center. From 11 AM-3 PM, a $5 individual admission fee is charged. 10 AM "Early Bird" admission will cost $10 per person. Palette will feature a number of vintage tube radios in all of their wooden,metal,plastic splendor. Our mid-60s Panasonic AM/FM Clock/Radio has been enhanced to the show time via the use of Nixie Tubes! Of note, when the radio plays,the clock does not and vice versa.Even better, when the radio is turned off, the clock comes back on to the current time.It must be magic! We’ll also bring a wide array of mid-century watches. The eternally-collectible Hamilton Pacer Electric Watch will be featured. Developed in the late 1950s with its unique asymmetric design, the Pacer was the first battery watch and the forerunner to the quartz watches,today. We have a number of Hamilton Electrics to show you.As well, we’ll display mechanical watch brands from yesteryear with such brands as Doxa, Jules Jurgensen, Lanco, and Wittnauer. Mid-Century wall and desk clocks will complete our display.The ever-popular Junghans Kitchen Clock/Timer will be present. A gray porcelain body houses an easy-to-read circular clock and a timer. Back before the days of microwave or even stop-top clocks, a Junghans Kitchen Clock/Timer let folks know when their meals were ready and in grand style to boot! We hope that you will attend the 2018 Vintage Voltage Expo and look forward to visiting with you as always!